Well, our one-month trip was various: 24 restaurants, 14 hotels, 2 resorts including hidden gems, city hideaways, new hotspots, old school grand hotels, modern business hotels and dazzling palaces. 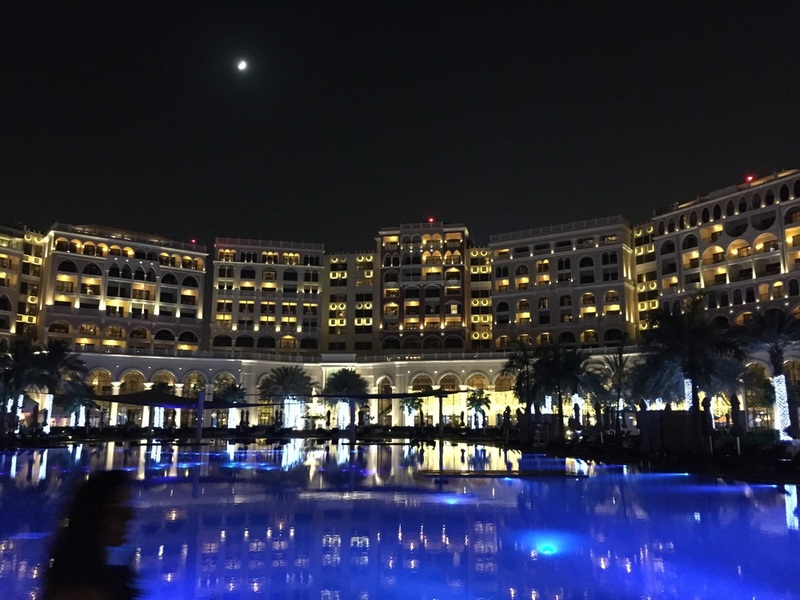 Of course there were some highlights (like the Raffles Istanbul or the Therasia on Vulcano) but one hotel got our full attention and honestly we both never expected that The Ritz-Carlton Abu Dhabi Grand Canal will be the most memorable and most perfect hotel we have stayed at. That's the reason for the delay in writing the review and being the last property to be featured on our blog. A short and comfortable business class flight from Doha to Abu Dhabi was the beginning of this wonderful day. Continued by an uncomplicated immigration process and smooth limousine transfer from Abu Dhabi Airport to our accomodation. Having expected a usual city hotel we were flashed by the big entrance gate and the fact about how big this Ritz-Carlton property really was. In fact we landed at an upscale resort property instead a boring city hotel. Our driver drove through the gate and we passed by several luxurious villas (which are also available for rental) until we reached the main entrance of the Ritz-Carlton Abu Dhabi. Three porters were immediately around our car, opened the doors and we stepped inside a completely different world. We kind of expected the hotels in Abu Dhabi to be glamorous and dazzling but what we found was taking our breaths. Although we had known that we had a Club Room (meaning that we can do the check-in also in the Club Lounge), we decided to do check-in right there in the high ceiling - yet impressive -lobby. The front desk employee was very kind and joked about our departure date - he wanted us to stay for a week ;-). If we would have known earlier about the amazing suite upgrade, this guy would be in real trouble now (just joking), handling with us begging to really stay longer! Within a seconds another nice front desk lady was accompanying us to the 7th Floor - where also the Club Lounge is. The whole resort is divided into different buildings, but luckily we never got lost. She opened the doors and there was it... our Suite! 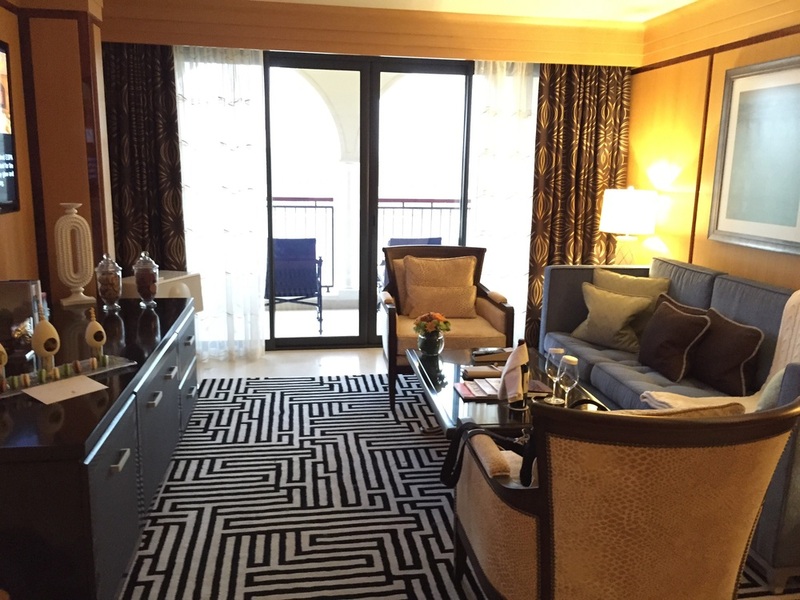 Spreading over 126 sqaure meters, this amazing Ritz-Carlton suite was really blowing our breaths away. Full of highlights, I don't know where to start. 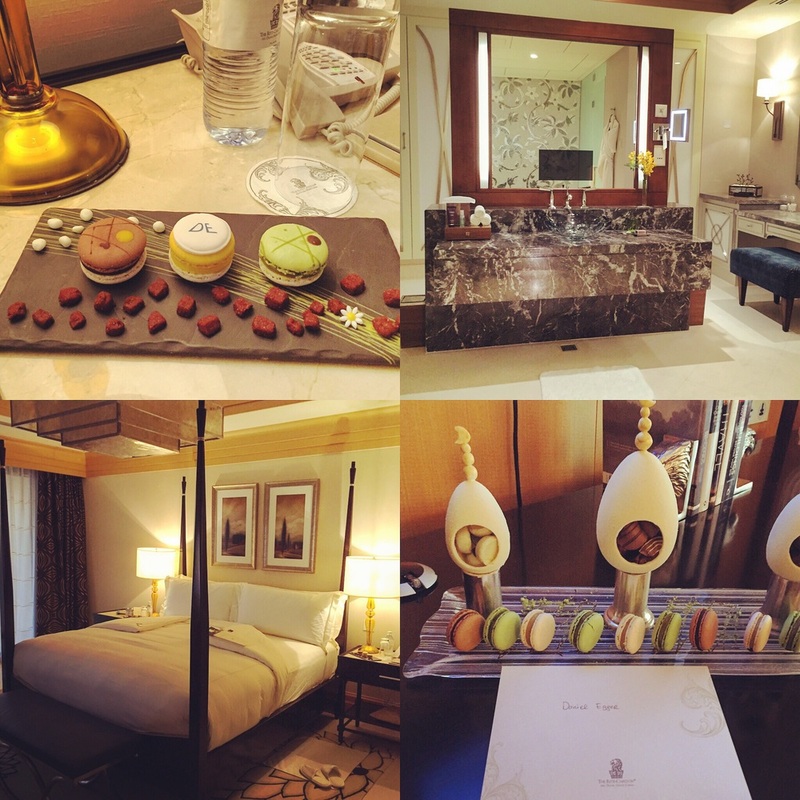 Well, the most impressive and most memorable thing about our suite were the tailor-made special amenities which included plenty of macarons and sweets while two macarons had our initials on it - that was kind of spectacular. One bottle of excellent South African wine was waiting as well as a vast fruit basket (seen only at the Ritz-Carlton Dubai Jumeirah Beach again!). On the next day, the chef of the kitchen prepared (just for us and the first time ever) Brezel with three different mustards and we got beer in addition to that home-feeling amenities. Is there any better way to celebrate the fact that the Oktoberfest is starting again in only 50 days? So back to the facts: Our Ritz-Carlton Suite was offering a huge entree with guest toilet, staff entrance with kitchen, huge dining room for up to 8 people, a seperated living area with huge television and Geneva iPod-Docking station as well as a comfy sofa and two armchairs, a spacious bedroom with supercomfy four-poster king bed, and last but not least a bathroom (bigger then the bedroom and living room together) with walk-in shower (yes, you could dance inside it and the rain shower was changing the light every five seconds), seperate toilet and bidet, deep bath tub, powder table (and not a small one), as well as plenty of storage space and double vanities with en-mirror-TV. The Club Lounge was just next door (thanks to a hotel which understands us ;-) ) and it was truly one of the best Club Lounges in the world (together with the Arts in Barcelona). All staff members were greeting you by your name and willing to help you with your plates or drinks. For example during breakfast (they have everything we desired and once they haven't got it, be sure you will have it on the next morning or within minutes by asking) I was not allowed to take the freshly prepared egg dish (by a private cook) to the table without help of one of the staff members. In this way I could get some bread and fruits - that's attentive service dear luxury hotels of this world! When we returned from dinner, we wanted to have some drinks. A very nice staff member was serving us glasses of sparkling wine and finally he even made gin tonic for us - we never had to leave our cozy seats! All products were of high quality and the snacks were excellent all day (I liked that they had not only arabic food). On the second day, the kind and very nice PR Manager Valeria arranged a special surprise for us. We did not know what to expect and were completely excited. When we took the elevator downstairs and went towards their signature restaurant "The Forge" - which is a steakhouse restaurant - we knew that the evening will be going to be nice. This thought was interruped when I saw wine glasses on a bar looking like made out of ice - now I was sure that this evening will be unforgettable. We had a wonderful night with special wines from all over the world (starting in South Africa, going over to Australia, passing by France and finally back to Germany). 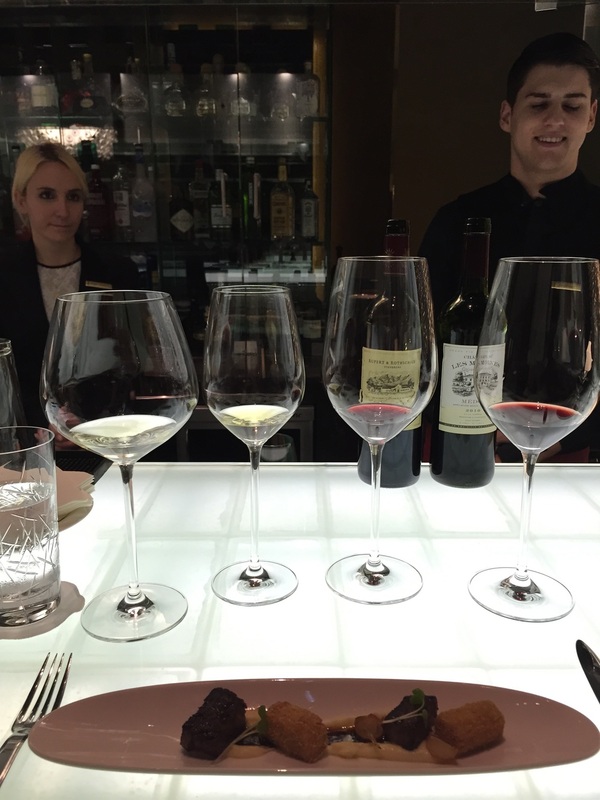 Jonathan, the somelier, was very good and had an excellent knowledge of wine - I would say we never met such a passionate wine lover like him. 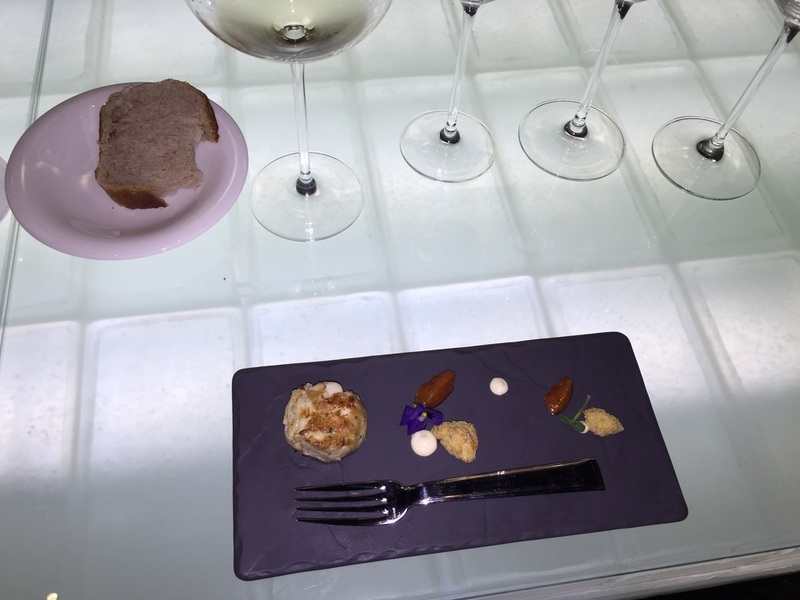 Of course the chef of The Forge did not wait long until we received the first of four excellent courses - the best of the best dishes were served together with these wonderful wines. So we ended up having tried beef tartare, foie gras, Wagyu beef and truffled french fries. This was one of the most wonderful evenings we have ever spent and I can truly recommend everyone to do such a wine tasting as well! Abu Dhabi is such an interesting place with lots of crazy things to do: driving the world's fastest rollercoster in the Ferrari World, watching Formula 1 at Yas Circuit, visiting the sumptuos Grand Mosque opposite the hotel (the hotels runs a shuttle service), doing a desert safari or visiting the Emirates Palace are just a few suggestions. That's the reason why time was short and I couldn't visit the ESPA at the Ritz-Carlton Abu Dhabi - which is so sad as ESPA is my favourite spa brand and all their spas are amazing. We also did not have time to dip into their vast outdoor pool. 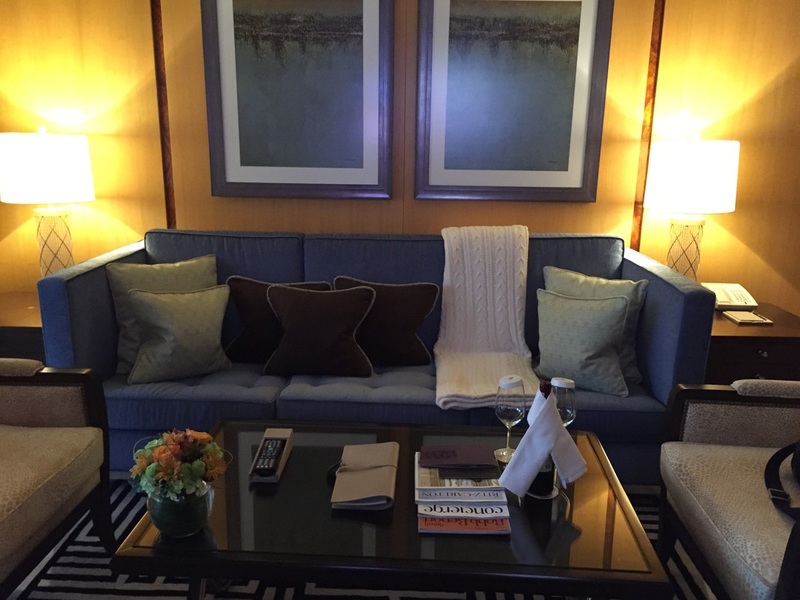 So you see, even we both have another reason to come back and we won't hesitate to book The Ritz-Carlton Abu Dhabi Grand Canal again for our next trip to the United Arab Emirates. We have stayed at many worldclass hotels and resorts, but this one will stay in our memories for a long time and now also occupies the top place of our list of the Best Places to stay worldwide - not the easiest title to get (as we are very discerning) - well deserved. A very special thanks to the ladies and gentlemen of The Ritz-Carlton Abu Dhabi for doing such a good job, keep offering such a high standard! We were guests of The Ritz-Carlton Abu Dhabi Grand Canal. All above written expresses our absolutely own opinion and has never been influenced. A bliss of the Oktoberfest in Abu Dhabi - what a perfect delight!